Paris has a lively street art scene. It dates back to the mid-1980s. Many of the original artists who established the genre have gone on to fame and recognition. You probably know the gigantic stencil Chuuuttt! that covers the entire wall of a building overlooking Place Igor Stravinsky behind the Pompidou Centre, even if you don’t know the artist’s name, Jef Aérosol. The mysterious French urban artist known as Invader, whose witty tile mosaics are inspired by the pixelated video games of the ’80s, can be spotted all around Paris and New York. These guys have become iconic and their work endures. Newer street artists sometimes use materials like chalk or a washed-on papier mâché which, when exposed to the elements, often disappear, leaving you to wonder where a work you liked has gone. It’s a temporal thing. I love to follow certain here-today-gone-tomorrow pieces, to see whether or not they’ve disappeared, and what’s replaced them. That brings me to love**. I remember the first time I saw it. It was November 2017. 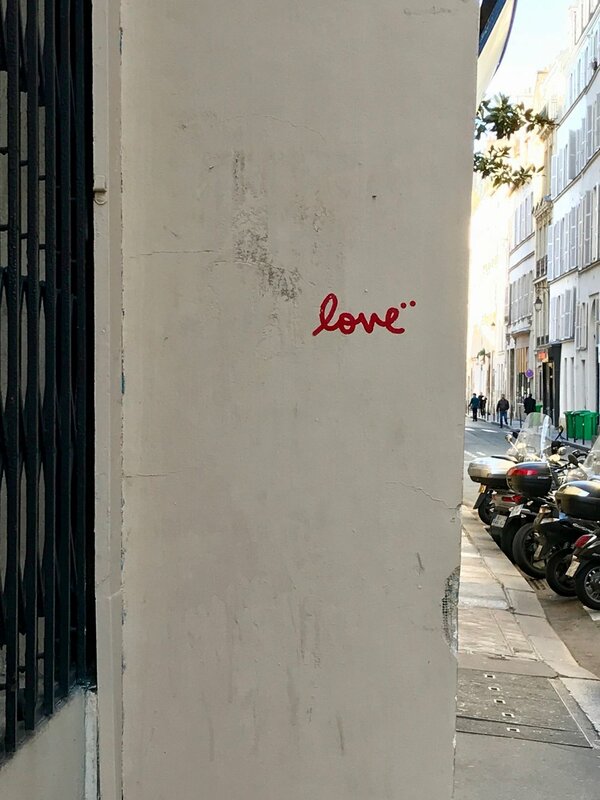 On a stucco wall angled in toward a tiny place not fifteen paces from my apartment building, someone had stenciled in red the word “love” with two raised dots after the letter “e.” It jogged a vague recollection. Maybe I’d seen it around and it hadn’t registered, hadn’t been so overt. This registered. Against the light-colored, otherwise blank wall, it seemed almost, well, aimed at me. I stopped, and smiled. It stayed as long as I stayed, until the end of November. In February, when I returned, there was no trace. The wall looked like it had been repainted, love** was gone. Snow fell in Paris. And later in the month, it popped up. A little smaller this time, and on the opposite end of the wall. Once again, I smiled. Then walking home one day, I saw graffiti scribbled all over it. I stood and looked, heartbroken, unable even to take a picture. I didn’t want to remember love** defaced this way. Eventually that one, too, was removed, though by whom I don’t know—the city? the artist? a competitor?—I’ve never caught anyone in action. I’ve also never seen another artist’s work on that particular wall, so maybe there’s a tacit territorial understanding among street artists. By April, we were back in business. It was spring in Paris and there was love**. I’m going back to Paris in a couple of weeks. Back to find love**.